Enjoy a variation on the classic martini by mixing up a gin cucumber martini. Making a gin cucumber martini doesn't involve much more effort than making a classic gin martini without the olives. Add a couple of ounces of the gin of your preference and a splash of dry vermouth to your shaker or pitcher, along with some cracked ice. Peel and slice a cucumber, and add some to your cocktail in progress. Shake or stir as preferred and then strain into a martini glass. Garnish your drink by floating a few fresh, thin slices of cucumber, and enjoy. While you can make a cucumber martini with any type of gin, the most commonly used brand is Hendrick's gin. Distilled in Ayrshire, Scotland, this unusual gin is infused with a hint of Bulgarian Rose and, appropriately, cucumbers. It is sold in a distinctive, apothecary-style brown bottle for around $25.00 to $35.00 for 750 ml. Although this particular brand was once difficult to find, it is becoming a staple in many restaurants and liquor stores. Puree cucumbers and add to the mixture (be sure to strain them first to remove seeds!) rather than just adding thin slices; this will infuse more cucumber flavor into your drink. Make your own cucumber infused gin. Add muddled basil or mint leaves for a twist. Muddled white grapes increase the refreshment factor. Use a little simple syrup or sour mix to tweak the flavor. Add some lemon or lime juice to brighten it up. Sprinkle a dash of salt or pepper for a more savory cocktail. Use vodka instead of gin if you find the taste too "herbal". Cut a chunky wedge of cucumber with peel on (it will look somewhat like a lime) and hang on the edge of the glass. You can even score the outside of the cucmber with a fork before slicing to create more attractive slices. Using a potato peeler, slice a long, thin piece of cucumber that you can float in the glass or pierce with a toothpick, folding it up like a ribbon. Cut spears of cucumbers that will resemble pickles and place in the glass. This works best if you are serving your martini on the rocks. Use a melon baller to create cucumber balls. Load a couple on a toothpick to resemble green olives. 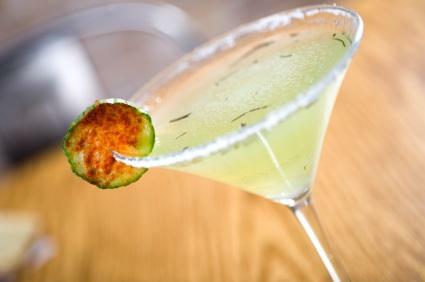 To add a little heat, sprinkle a cucumber slice with paprika and salt the rim of the martini glass. Don't waste anything: you can also use the cucumber peels as garnishes. Not your typical fruity martini, this drink is sure to be enjoyed by men and women alike. Add this refreshing cocktail to the menu for your next party or order one when you're out on the town.